So this has happened three months in a row now. I'm in a computer field so i don't want to waste time with all the "Well are you sure you know what is using internet." because I am. The answer is there is no possible device in my house still using the internet and we are already at 0% on our 30GB data plan. I've notice Hughesnet is pinning a lot of data loss advice posts, almost like they know this problem is internal and a lot of people are having this issue but they don't want to deal with it and they hope people just believe they are the ones at fault. I just want to get in contact with someone at Hughesnet who can start running tests and determine what they need to do to fix this issue. I know for a fact it is on their end, especially after reading many related posts here. If I need to give any info on here to get started let me know. Also I will need to be alerted to where Hughesnet is contacting me, if they try by email they might try going to one I don't use often. Right now I currently don't have any logs, since it looks like there aren't any devices connected to produce data usage activity. This could be simply you're not on the site and no one's using the service at this time. What I am able to see is the amount of data still remaining on the cycle, which currently shows me about 22 GB. I refreshed every couple of minutes to see if it shows any activity, but there was no change. Seems like everything's in order based on your screenshots, that's great! There is a chance that the marginal alignment may have been causing packet loss which would show an increase of ghost data usage. I reviewed your account in the past to see if our logs showed any packet loss, and I did see between July and August is when this started. With that alignment being fixed, I would say that it's possible it fixed itself. You may have to run tests on your end before the reps are able to help you. The following is the test you will need to perform in order for the reps to help you. The reps are on M-F from approximately 8AM to 5PM EST, so that gives you time to run this test. Please perform the test as outlined. The test can be run even if you are out of plan data. The reps will contact you here, either in a reply or through PM on the upper right. Please perform the following test outlined in the graphic below. This is known as a modem isolation test, and it will help to determine whether the issue is with Hughesnet or your local network..
1: Disabled the WiFi in the HT2000W modem. 2: Take a screen capture of the HughesNet Usage Meter, along with the clock on your computer screen. 3: Disconnect the LAN cable from the modem, noting the date and time of disconnect. 4: Leave the LAN cable disconnected from the modem for several hours, HughesNet recommends doing this overnight, or during the day while at work. DO NOT unplug the modem from the power. The modem must remain powered. 5: Reconnect the LAN cable to the modem, noting the date and time of reconnect. 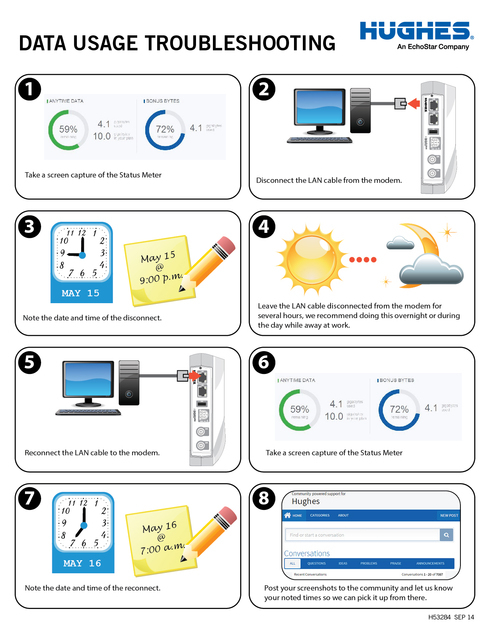 6: Take a screen capture of the HughesNet Usage Meter, along with the clock displayed on your computer. 7: Post your screens hots to the community. Please DO NOT unplug the modem power after running the test. The reps need to be able to reconcile the test results with the modem logs, and disconnecting the power from the modem erases those logs. Please be aware, if you downloaded any large files just prior to this test, or if the disconnect was for an extensive time period, some usage may appear to have occurred, but it should be rather negligible. If you don't know how to disable the WiFi in the HT2000W, please see "How do I manage my built-in WiFi modem?" in this PDF. Please be sure to click "Save Settings" after unchaining "SSID Enable" for each of the four tabs individually (2.4Ghz, then 2.4Ghz Guest, then 5Ghz, then 5Ghz Guest). I should add that, because the power needs to remain to the modem after running the test, it would probably be best to run the test the night before you present the snapshots. This way there's less of a chance of the modem being unplugged, or losing power because of a storm, etc., between the time it was run and the time they view the data. The less time between the test and the viewing, the better, in other words. Sounds good, thank you for all the info since I kind of had to just shout out in the dark here. I'll be starting the test now, and then unfortunately I will have to leave the property where my Hughesnet router is located for the week, so we'll see if the reps are ok with 3 hours of testing instead of overnight. Theoretically they can check the logs from the past week on their end and get some more info too. Plans have changed. Some friends came over and I really don't want to have the internet off with them here (even if it is pretty useless in its FAP state). So for any rep that sees this post can I please just get a confirmation that you are aware of it and I will begin the test and upload the results here sometime in the next two weeks when I get back. I can @ whatever rep responds here when I upload the test. I don't think that running the test over a longer than normal span of time would necessarily be an issue, but the longer the time span the greater the chance of a power interruption, which would cause the loss of the modem logs. The reps won't be back until tomorrow (Monday), but it may take them a day or two to reply. The one thing to consider, though, is having something plugged in and running while no one is going to be there. If you're comfortable with that, I would start the test before you leave and get your disconnection snapshot. If not, I would wait until you have more time at the property and just unplug the modem for the time you're going to be away. I'll tag a couple of reps so that they can give you a definitive answer. Again, though, they may not reply before you leave. Hello ryry117, thanks for posting! I was able to locate and review your account. The first thing that caught my eye is that our logs show there has been 197 GB used within the past two days. Based on connection time, it looks like the only device that could be associated to that data is listed in the modem as "Ryan". Do you know what device that might be? 197 GB used within the past two days. * Disclaimer: I am a HughesNet customer and not a HughesNet employee. All of my comments are my own and do not necessarily represent HughesNet in any way. I don't even know how that's possible. Even if someone had the 50/50 plan, and they started from scratch, the other 97GB would still take a little over 77 hours at the top FAP speed of 3Mbps. Plus, the OP has the 30/50 plan, and they're apparently already out of data. But, even if it had just rolled over, it still doesn't make sense. I just don't get it. The only way I can see it is a LOT of data tokens.